In previous posts I have astrologically presented four political personalities, who in terms of economic and social policy stand in the conservative and center-right spectrum. Today I look at horoscopes of two Chancellor candidates, who were supposed to lead socialist parties in Austria and Germany out from the crisis, and who both did not win the elections. Note: Although a horoscope can provide information about professional choices, which requires exact time of birth, it can not provide clear information about political choices in terms of left or right. 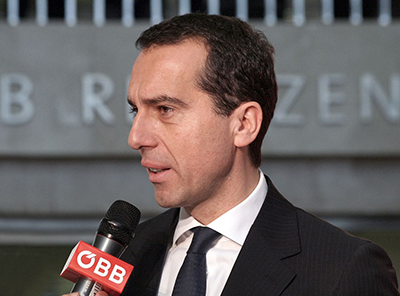 Christian Kern became known to the general public as the CEO of the Austrian Federal Railways (ÖBB), who in the chaotic crisis summer of 2015 demonstrated publicly good management, and succeeded to transport countless refugees by train and temporarily accommodated them at train stations in an organized manner. Before that public exposure, he was fulfilling his CEO task of rescuing the Federal Railways. Kern was elected as party chairman of the SPÖ and appointed as successor to the already resigned Chancellor Fayman in May 2016. Later he became a Chancellor candidate for SPÖ and did not win the legislative election in autumn 2017. The birth time of Kern is not known, the horoscope drawing is created with solar houses. On the day of Christian Kern’s birth the Moon moved from 29 degrees Taurus to 12 degrees Gemini. If his Capricorn Sun is combined with the Taurus Moon, that would suggest a very pragmatic and practical person, ambitious and stable, who patiently walks his own path. With the Moon in Gemini patience and stability would be less pronounced but the economic talent just as much emphasizing, although more through the gift of combinatorics and eloquence, than through careful and conventional approach to business, as would be the case with the Taurus Moon. However, his Capricorn Sun forms a sextile to Saturn and a trine to Uranus and Pluto. The responsibility and the openness for the new, play hand in hand with the ambition. The Uranus-Saturn opposition supports the talent for management and leadership which is already suggested by the Capricorn Sun with its strategic talent and pragmatism. 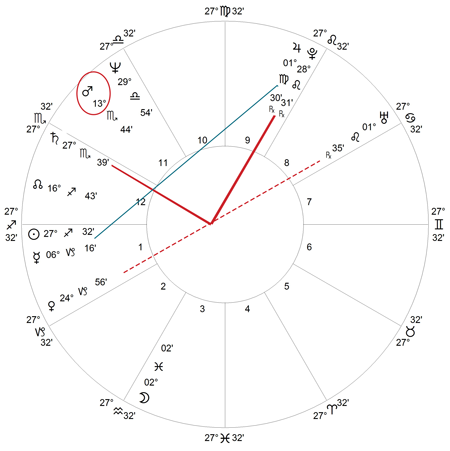 However, this Uranus-Saturn connection can be challenging and some kind of indecision, perhaps hesitation, may slip in in certain situations - this opposition is linked to Jupiter and Mercury in opposition, their classic dispositors. With the Gemini Jupiter in opposition to Mercury in Sagittarius, it is possible that some degree of good-faith or over-estimation challenge his pragmatism. The Venus with Mars in Aquarius is a combination with an interest in people, whose inherent passion can eventually focus on social issues. I can not see idealism in this horoscope, but opposition between Jupiter and Mercury, both of which are in mutual reception, forms a square to Uranus and suggest marked intellectual inclinations, intellectual independence and confrontation with ideas and concepts. And suggests also someone who likes to discuss and who holds firm opinions. The vanity or extravagance, often referred to in media because of his tailored suits and expensive watch collection, are not inherent to the core of his personality - Capricorn Sun with Taurus or Gemini Moon, sets other priorities. This characteristic might be an expression of overcompensation, but in this horoscope it can not be astrologically validated without knowing the Ascendants and the houses. Compared to the horoscope of Emmanuel Macron, who is also a career changer, Christian Kern does not seem to be particularly adventurous or willing to take risks. Macron's horoscope suggests that his digression into politic, is pursued as an adventure and opportunity to confirm himself. It is difficult to understand from the horoscope of Christian Kern why he took a plunge into politics. 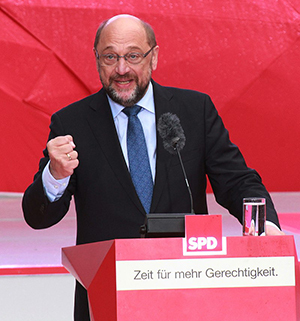 In the election year of 2017, Martin Schulz was celebrated almost as a Messiah who will take the SPD to new heights. He became party leader of SPD and chancellor candidate against Merkel in one go. But the so-called "Schulz effect" did not happen. After his defeat, he made several politically controversial steps, with the result that in February 2018 he renounced his participation in the government and resigned as party leader. So, what does the horoscope of Martin Schulz say? Also for his horoscope the birth time is unknown. The horoscope drawing is shown with solar houses. We see the Moon is in the sign of Pisces. If he was born immediately after midnight, the Moon could be in the last minutes of Aquarius. The Sagittarius Sun with Pisces Moon suggests a preference for ideas and a tendencially philosophical nature. Although the urge for self confirmation is present, it is not pretentious. Idealism is also part of this combination. With the Moon in Aquarius, idealism would still be there and would be accompanied by certain pragmatism and inner stability. The Moon in Pisces is more flexible, both in regard to ideas and in general. With the Mercury in Capricorn the thought process is focused on facts, it is analytic and not superficial. 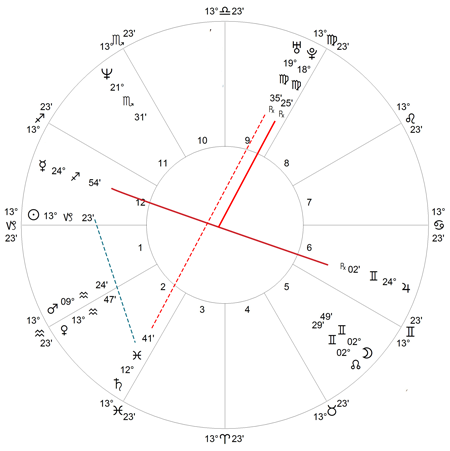 The Sun and Mercury both form a trine to Jupiter, suggesting tolerance and level-headedness in communication. The Mercury is in the midpoint of Mars and Pluto, which is a sign to good salesmanship and convincing talk. But Jupiter in Virgo is the ruler of the Sun and, if the Moon is in Pisces, it is the (classical) ruler of the Moon too. The otherwise inherent optimism, thirst for adventure and self-assurance of the Sagittarius Sun are somewhat subdued. The Scorpio Mars in his chart is emphasized and indicates a deep seated combat readiness, which is not openly displayed. With the emphasized Water and Earth element, his horoscope suggests anyway caution and strategy. Saturn is the ruler of Mercury and Venus, and if the Moon is in the Aquarius, it is the classical ruler of the Moon too. This means that many personal characteristics and interests are focused through the Jupiter - Saturn square. This constellation, where also Pluto forms a conjunction with Jupiter and a square to Saturn, corresponds with good organizational skills, the interest in social issues and last but not least with the desire for power. But the whole picture also promises obstacles that can and must be overcome before the potentials unfold. It is known that Martin Schulz struggled with alcoholism in his youth. From the horoscope of Martin Schulz, as well as from the Merkel's horoscope we can assume politics as a profession, even without the known birth time. After a successful career in the EU Parliament, in the aftermath of the election campaign, Martin Schulz made some missteps that represented him as inconsistent or even as a person without integrity. After the electoral defeat, he categorically refused Big Coalition and assured as well categorically, never to join the Cabinet of Merkel. But soon afterwards, he changed his mind and also snatched the post of Foreign Minister from Sigmar Gabriel, who had previously gave over to him the party leadership and chancellor candidacy. I suspect behind all that the reactions of a Pisces-Moon which instinctively seeks to adapt. If the Moon were in Aquarius, Schulz would have had more inner stability and more solidarity with his own ideas. This Sun-Moon combination in Mutable signs may well be good negotiator due to its inherent flexibility, but also contradictory and inconsistent, which occasionally brings consequences with it, which the rulership by Jupiter in the detriment can suggest. I suspect behind it the reactions of a fish-moon, which instinctively tries to adapt. If the moon were in Aquarius, Schulz would have had more inner support and more solidarity with his own ideas. This Sun-Moon combination in changeable signs governed by Jupiter in the Detriment may well negotiate by the inherent flexibility, but also be contradictory and inconsistent, which occasionally pulls consequences.